Think you’re too busy to decorate for spring? 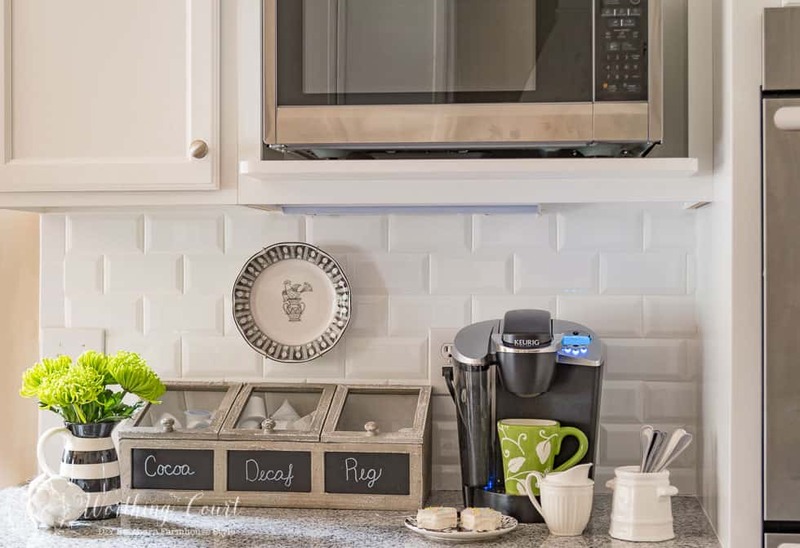 Try these quick and easy ideas for refreshing your home in 10 minutes or less! Winter is pretty much over and you’re ready to freshen up your home for spring – but who has the time or energy??? I get it – really I do. Don’t worry – you don’t have to reinvent the wheel or overhaul your whole home to get that springy awesomeness! All you need are just a few simple spring decorations to tuck in here and there among your existing decorations. 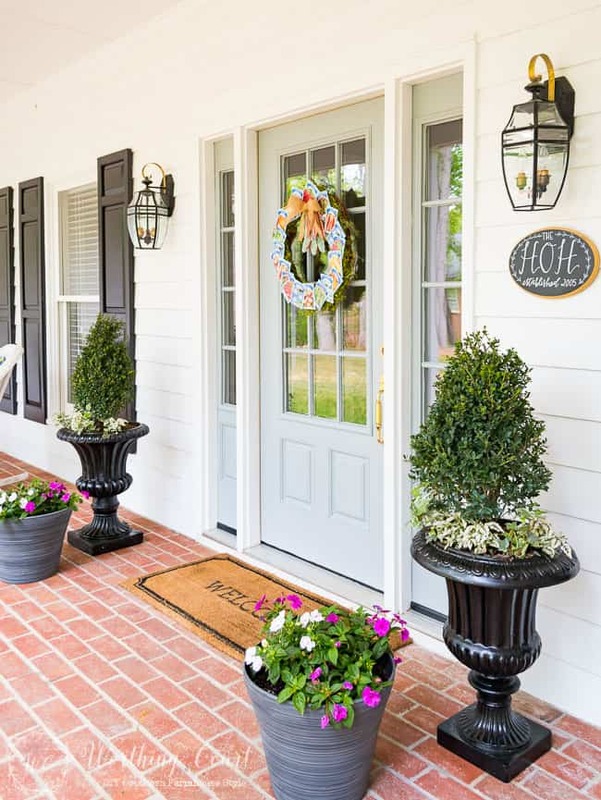 I readily admit that I probably do more seasonal decorating than most people, but that’s because my mission, as a home decor blogger, is to encourage and inspire you, no matter the season. 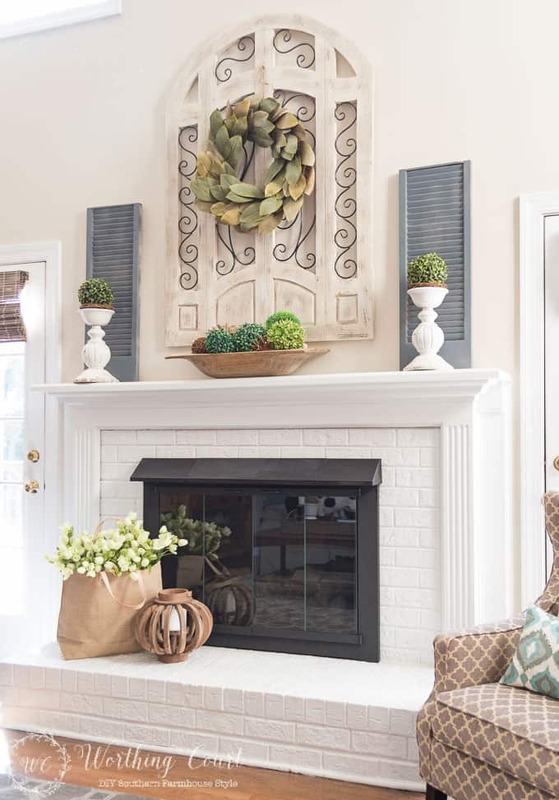 So instead of feeling the pressure to redecorate a whole room for the season, let’s take a look at just few really simple ideas that you can copy in ten minutes or less. 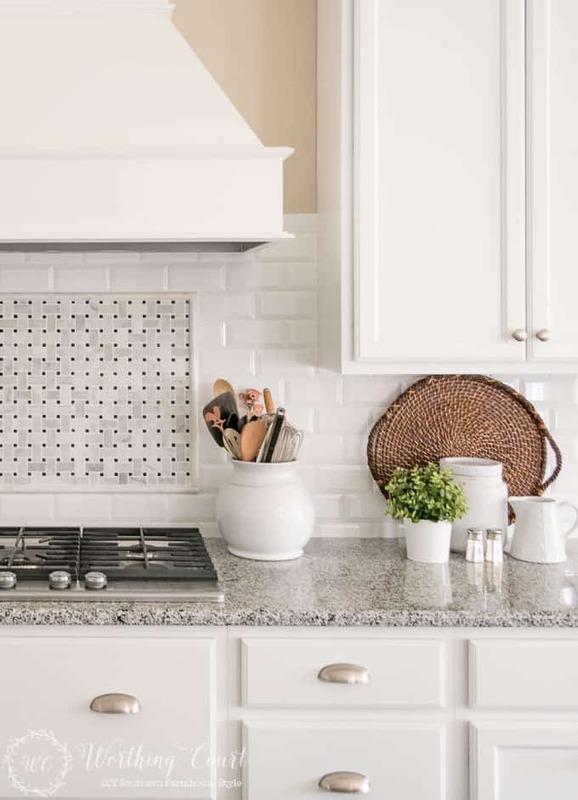 To help make it easier for you, I’ve included links to the exact or similar products that you can use to get the look for your own home. Some of the links are affiliate links, which allow me to make a small commission on your purchase, but at NO additional cost to you. See my full disclosure policy HERE. It only takes a few minutes to fill a basket with faux florals and add a touch of whimsy to create a uniquely you “wreath”. The secret is to start with the longest branches first, then tuck in a few shorter flowers, or in my case, a few colorful butterfly picks into the longer branches, but toward the front. 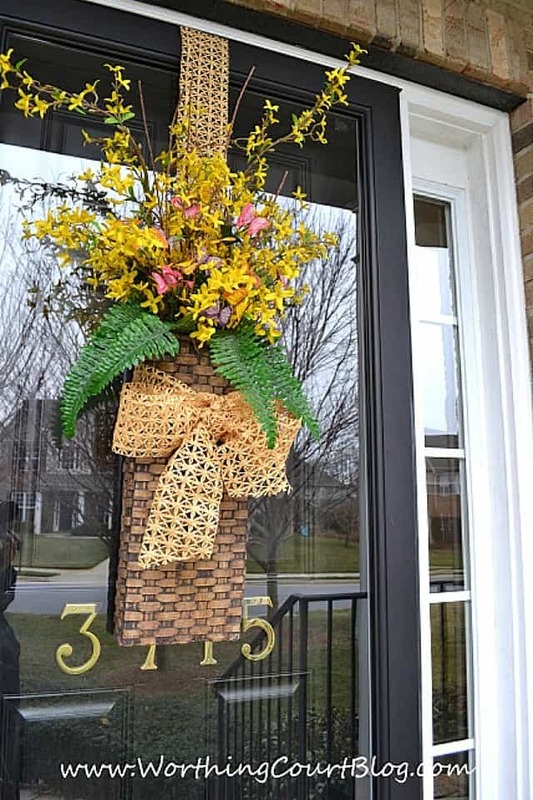 Add a few greenery leaves around the opening and tie a bow with nature-inspired ribbon around the basket to finish it off. Don’t be afraid to fluff and re-position the stems until you have it looking just the way you want. Get an early start on spring container planting so that your plants will have time to grow and fill out before the season is over. You can fill a container with a shrub and some ivy in no time flat!. 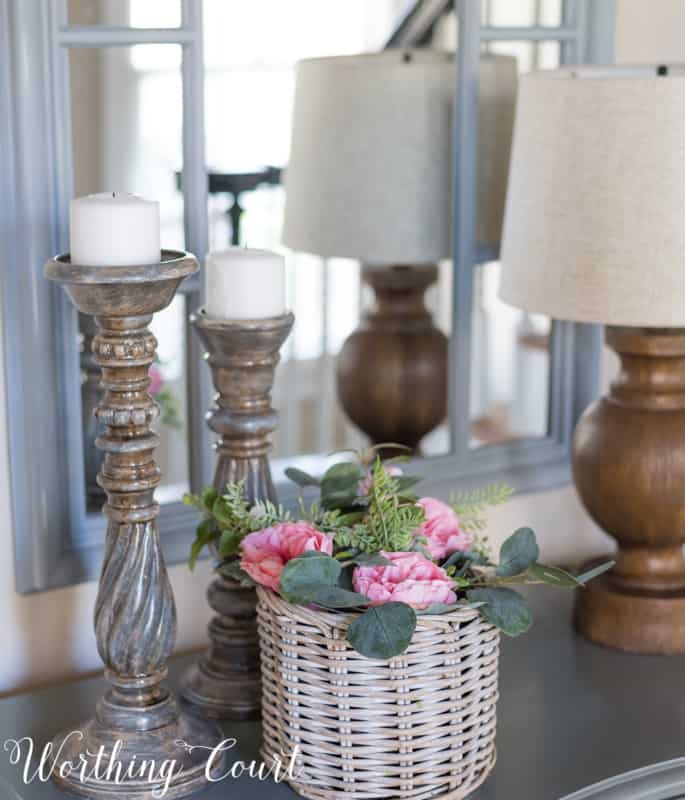 All you need for a welcoming spring vignette in your entryway are a couple of candlesticks along with a cute container filled with pretty pink (or any other color) flowers and a few eucalyptus leaves. Oh, and a lamp to turn on in the evening will help to welcome anyone arriving at your front door too! There are several quick and easy spring decorating ideas in this one corner, but you don’t have to use them all. 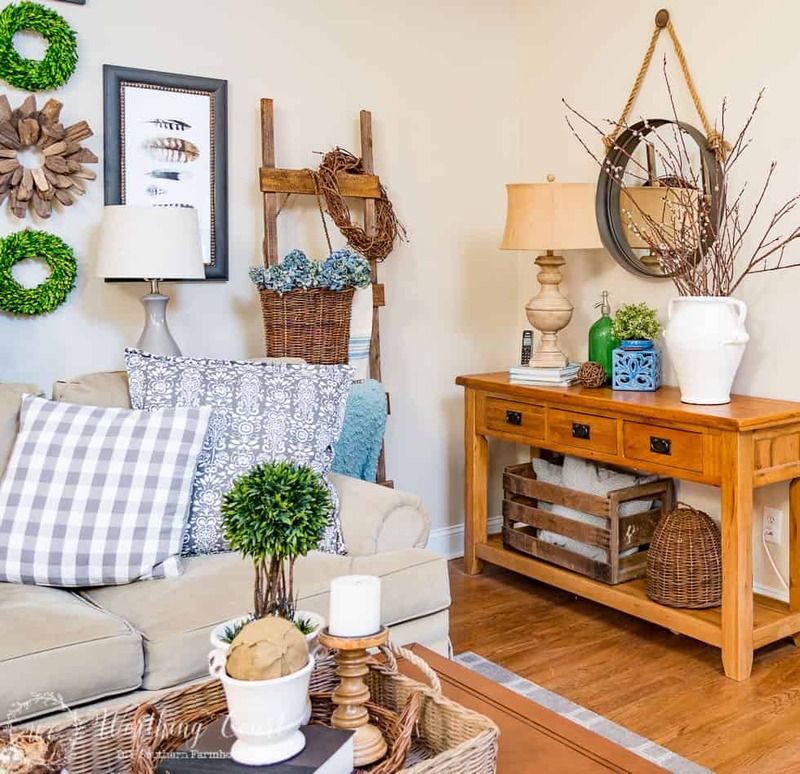 All you need to do is to choose just one spot in your room, where you enjoy setting up a display, and put those spring greens and blues to work! You don’t have to have a fireplace either – here are several ideas that you could copy and place in other parts of your room. 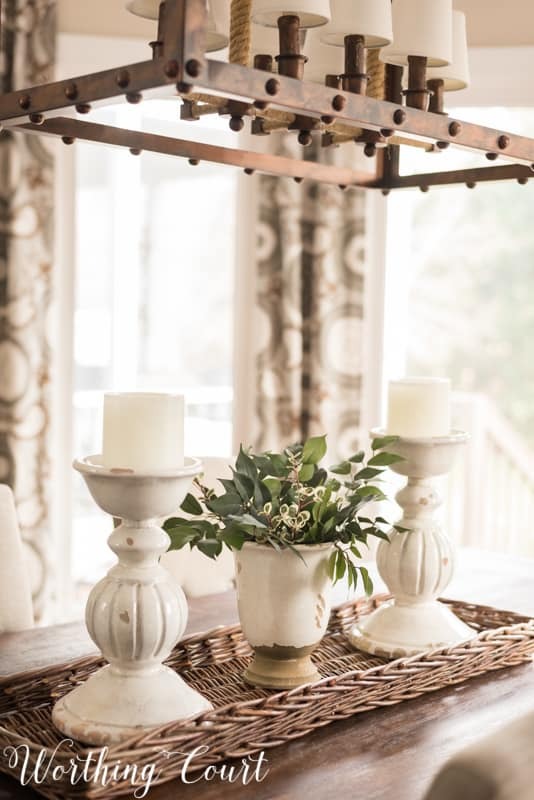 Candlesticks that are topped with faux greenery orbs could be placed on a side table or sofa table. A dough bowl or basket filled with greenery and/or grapevine orbs could be placed on a coffee table. A tote filled with faux flowers could move anywhere around the room. Each one of these ideas is a little outside of the box and will create lots of interest! 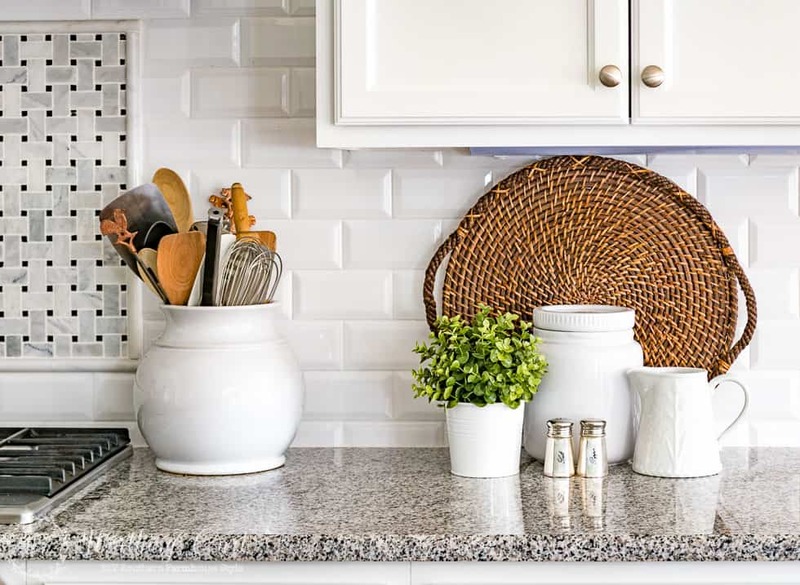 I prefer the look of uncluttered countertops – too much stuff just seems to stress me out when I’m actually working in my kitchen. All it took to make this little vignette springy was the addition of a small potted plant and a wicker tray. Prefer fresh flowers over faux? 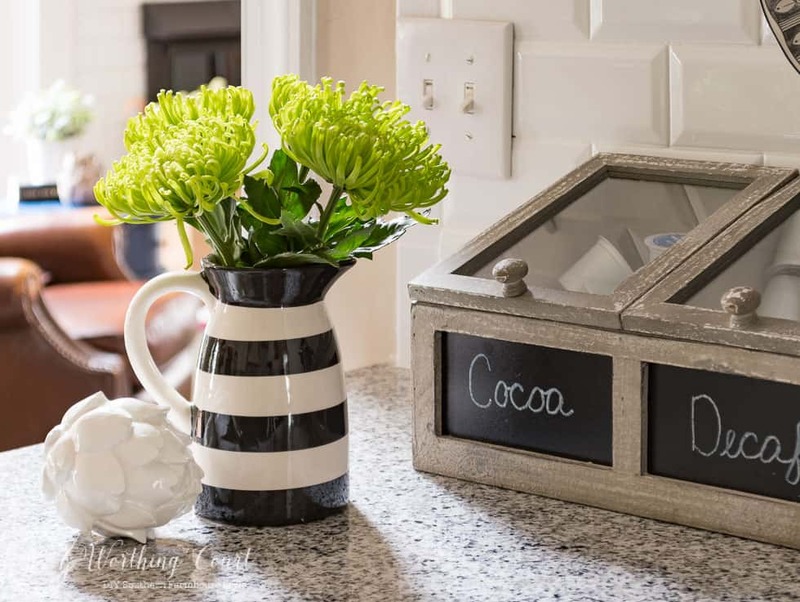 Look at how easily you can add a pop of spring to your kitchen for just $5 from the floral department at the grocery store! I think that most of us love to have a pretty centerpiece on our dining tables, but they don’t have to be anything complicated. 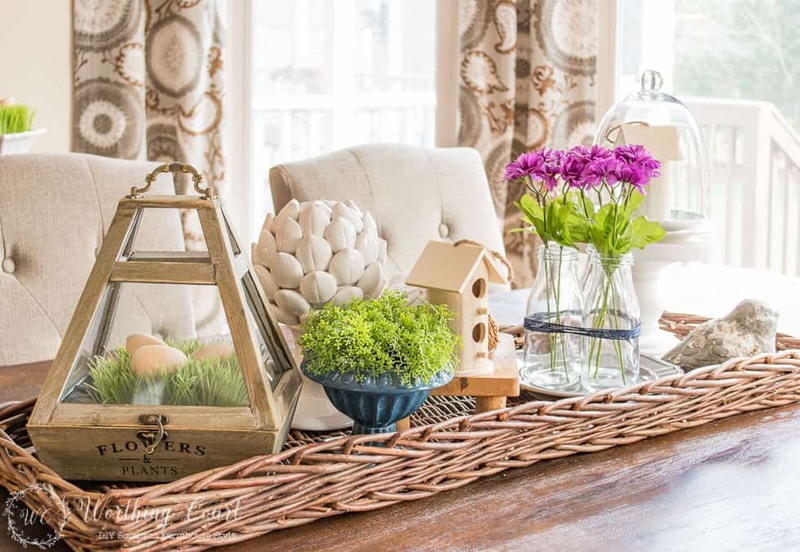 Take a look at how I’ve styled the same wicker tray two different ways for a fresh spring look. Great tips Suzy! I love the vignettes you have in the dining room! I really like lanterns and have several in m,y home. Since my style is coastal, it just makes sense to have lanterns! I like mixing different styles and textures with the lanterns. Thanks for sharing! Thanks for the spring ideas. I am in a warm climate for another month so spring is here. The spring flowers are blooming and it s nice to get your inspiration so when I get home, I can dig in. Beautiful arrangements! I’m so ready for Spring. Where did you get the box you have your coffee and cocoa stored? I like the tray with your birdhouse and terrarium. The colors look so much like a spring day! I am so ready for warm springtime! Great ideas for Spring! I love the pops of color that your arrangements bring. You are always an inspiration. I make at least a few seasonal changes every month in my house (I work full time and am getting “older”) but that is my treat to myself, to make a comfortable pretty place to occasionally relax! Thank you for the extra push I sometimes need to make the time. Great ideas Suzy. Thank you for posting! Hi Suzy, I love the Greenhouse you used on your breakfront, can you tell me where to buy one? Hi Celeste. I don’t see what you’re asking about in any of the images in this blog post. Can you tell me more specifically what you’re asking about? Hi Suzy , you used it in the den behind your sofa as well…..
Ok, now I know what you’re asking about! It came from At Home a while back, but I still see them in the store. Thank you for your time! You have opened my decorating mind and now I think out of the box! How lovely to have a visitor all the way from Scotland! I would love to visit your part of the world one day.